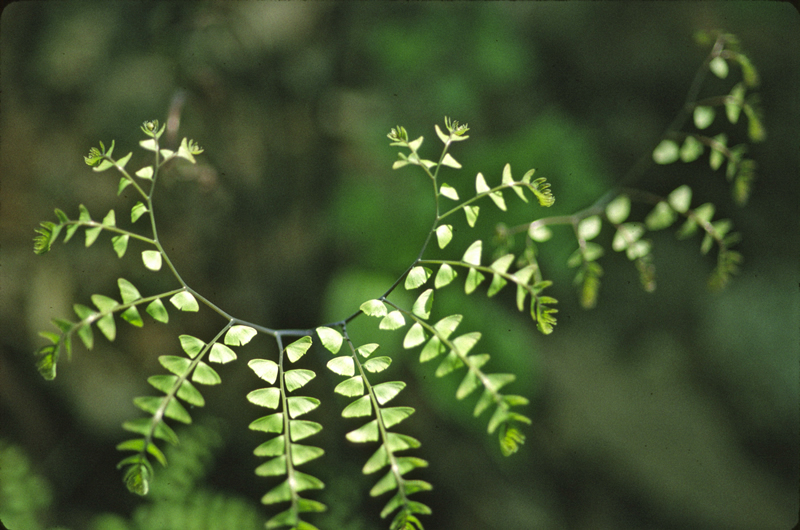 The maidenhair fern is a finely-textured, somewhat frilly fern that has curved stalks covered with finger-like projections. They grow to a height of 1 to 2.5 feet in part to full shade which makes them perfect for shaded borders, woodland gardens, or shaded rock gardens. They can grow in sunnier locations, but high summer heat may cause the fronds to brown, particularly if good soil moisture is not maintained. Like many ferns, the maidenhair fern prefers moist, acidic soils and spreads slowly to form large colonies over time. They have water-repelling compounds on the foliage with the result that water runs off the leaves, and even when the plant is immersed in water, the leaves remain dry. This strong water repelling property is the scientific basis for the botanical name Adiantum, translated as “unwetted”.